I wrote my very first blog post on July 24, 2005. That blog post is no longer live because it was terrible. The post was called, “Winning the Search Engine Marketing War.” It was 412 words long, contained no images, no external links, and it didn’t provide much value because it didn’t teach you anything. But you know what, back in 2005, the blog post was pretty darn good. See, I wasn’t competing with a lot of blogs back then. 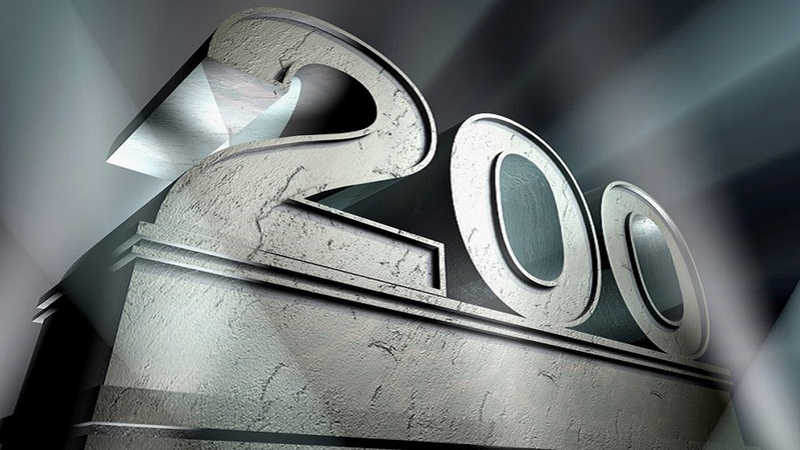 Currently, there are well over 440 million blogs and back in 2011, that number was 173 million. And in 2005, the web was still so small that there were only 64 million websites (with only a small portion of them being blogs). In other words, my first blog post was pretty darn good because something is better than nothing. People were just happy to get some information, even though it wasn’t great. But over the years, blogging has changed. What it used to be in 2005, isn’t what it is today. It was a place where you would share your personal experiences with the world. From photos of the places you traveled to and blogging about the food you ate to even sharing personal information about your family life… In 2005, social networks weren’t popular. Facebook launched in 2004, but it wasn’t what it is now. And sites like MySpace focused heavily on music. As social networks evolved, people realized it was easier to share personal stories on Facebook and Instagram than it was to write a whole blog post. Over 250 million people share what they are doing in their personal life each day just on Instagram. All you have to do is talk (or look) into your phone for just a few seconds. It’s really that simple. And that’s why more of you use social networks on a daily basis than a blog. Just think of it this way… if you wanted to update your friends on your life, is it easier for you to just upload some pictures to Facebook or is it easier for you to write a blog post? Of course, it’s easier to just upload some photos to Facebook. It’s why Facebook is so popular. For that reason, people started to focus their attention on Instagram, Facebook, Twitter, LinkedIn, and Snapchat over blogging. So why do people continually create more blogs? There are many reasons why blogs have grown in popularity. As I mentioned above, there are well over 400 million blogs today. The biggest reason why blogs have grown in popularity is that you are an end user and continue consuming the content that blogs put out. Just in the United States alone, 42.23% of people from the ages of 18 to 49 read blogs. And because people want to read blogs, Google has no choice but to rank them. The average page that is listed on page one of Google has 1,890 words: There are many reasons you may want to create a blog, but from someone who blogs on a weekly basis and has been for 13 years, here are the main reasons to have a blog: You control your own destiny – social networks have restricted how many of your friends actually see your content. With a blog, you have more control over your destiny. You can collect emails to get people back to your site, you can build a push notification subscriber list, you can rank your content on Google… overall, it’s just easier to get a consistent stream of traffic from a blog than it is from a social profile because you aren’t relying on 1 traffic source. This is more important than ever because the top referring sites on the web are starting to send less traffic out to other sites. Paid ads are expensive – Google generate 6 billion dollars in ad revenue in 2005 and that number shot up to 95 billion in 2017. With ad costs continually rising, you have no choice as a business but to find other traffic channels. A blog is an obvious question as Google loves ranking text-based content. Just look at Wikipedia, they rank for everything and generate 5.4 billion visits a month. Marketing has moved to an omnichannel approach – there are currently 1,766,926,408 websites on the web. In 2005 that number was only 64,780,617. That’s a 2,627% increase. That means you as a business have more competition online, which gives consumers more choices. Why should someone choose you over the competition? Well, branding plays a huge part, if you can get a consumer to see or hear about your brand 7 times they are much more likely to be a customer. A blog creates another additional touchpoint. A blog isn’t a blog, it’s a business As more sites have come online, SEO has become more competitive. Yes, more people are using Google, but they are searching for the same popular terms. With Ubersuggest, we have a database of 646,777,704 keywords. And out of those keywords, only 15,301,405 keywords generate a search volume of an excess of 10,000 searches per month. As more people come online, it doesn’t mean that they search for brand new keywords. It just means that the popular terms get even more popular. That’s why it is harder to get people to come to your site over the competition because you are competing with more companies to get those eyeballs. See, as SEO has become more competitive, you have no choice but to treat it as a business. It takes time and money to produce content. It takes time and money to promote your content. And then once you have those visitors, it takes more time and money to convert those visitors into paying customers. In other words, because it is so competitive, you won’t do that well unless you put in tons of time or money (or ideally both). Just look at Quick Sprout, the marketing blog I don’t put much money into it. Even though it’s older than NeilPatel.com, it generates a lot less traffic. NeilPatel.com blog generates 693% more traffic because I put over 6 figures into the blog each month (mainly in developing free tools and creating audio and video content), and I treat it like a business. Conclusion Look, I am not trying to persuade you into building a blog. But I believe most companies should have a blog. And if you don’t have one, just follow this guide to get up and running. A blog is the only way you are going to rank well on Google and generate traffic without directly paying for it by using Google AdWords or Facebook Ads. But if you want to do well, you can’t treat your blog like a “blog”… you have to treat it like a business. If you don’t, then you won’t do well. Here are the 3 important steps you need to take if you want to do well: Focus on writing amazing content consistently – it’s not about writing one or two amazing posts… you have to be consistently awesome. The market is so competitive, you can’t write 400-word blog posts as I did in 2005. Sure, if you are in a new niche with no competition, by all means, write 400-word posts, but the chances are you are going to eventually have some competition. And if you don’t have the time, you should just hire a writer to help you out. Promote your content – after you have content, you’ll have to promote it. Promotion isn’t easy but I’ve broken it down into 4 steps for you. Just follow them and you’ll do well. Focus on monetization last – most bloggers who get this far face one big problem… as their traffic increases their revenue typically stays flat. Just because you have more visitors, it doesn’t guarantee an increase in revenue. Towards the end of this blog post, I teach you how to convert those visitors into leads and customers. Follow them. Don’t forget about voice – I know I said you only have to follow 3 steps, but if you’ve followed all of them successfully, you’ll need to start thinking about voice. 40% of adults use voice search daily, so don’t take it for granted. Follow this guide to ensure that you capture the voice search market share before your competition. What do you think about blogging? Are you going to start taking it seriously? 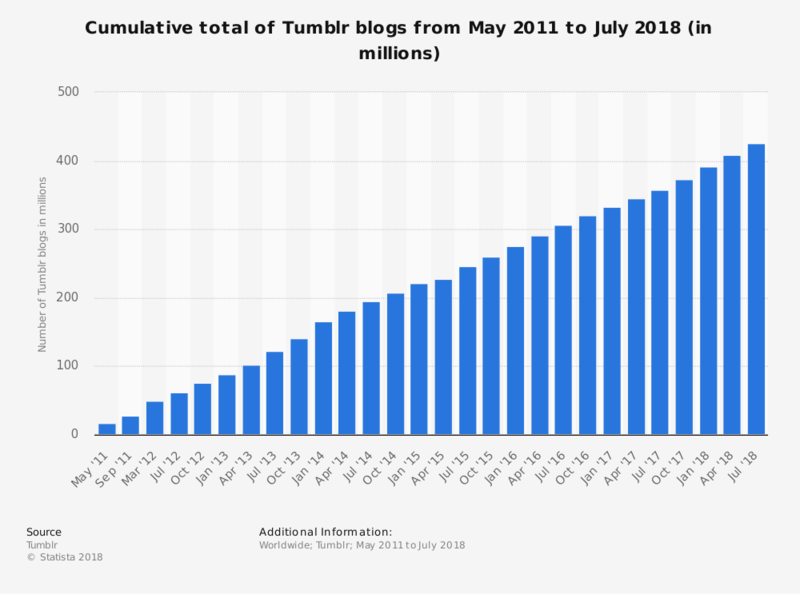 How Many Blogs are there in the World in 2018? Quick answer: more than 440 million! We have been reading lot of articles about this number and we also found the picture below. That was just Tumblr!!! So the real question is: how much do you have to work to get out of the mud and gain some internet visibility? Well, you should write posts with more than 2000 words. That’s it! How much does it cost to place ad banners online?